As the famous experiment shows us, the normal reaction to something that will kill you, is dulled so much by gradual change that the subject will fail to react in time, or at all, and die. It is much the same with politicians, the gradual rise in the earth's temperature (melting of ice, etc) will pass them by all the while they are profiting from the system that got them elected and there are no shouts of complaint. 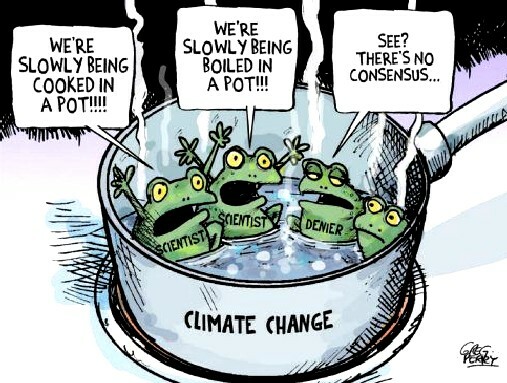 The only way to get politicians elected who will take immediate action is to protest loudly and consistently, until such time as candidates will come forward who want to make the urgent changes that are needed, because the noise is so loud that politicians cannot stand it any longer..
BOILING FROG SYNDROME - This is why the politicians of today are unwilling to act to save their children and the planet. 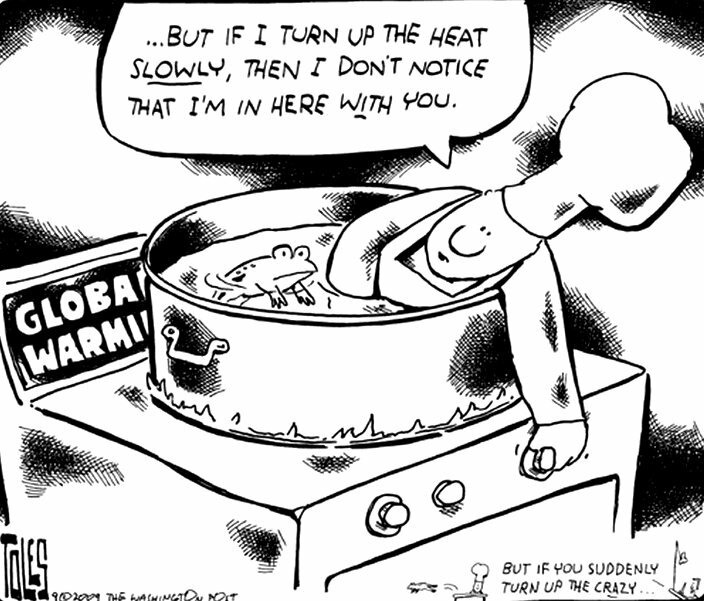 They are climate fools in not adjusting to changing circumstances until it (potentially) kills us all. Are we about to let that happen? 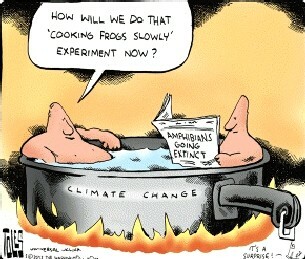 Other 19th century experiments were purported to show that frogs did not attempt to escape gradually heated water. 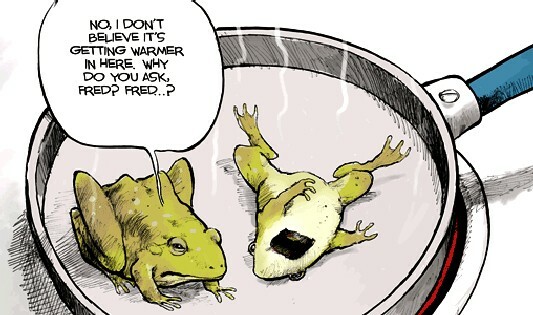 An 1872 experiment by Heinzmann was said to show that a normal frog would not attempt to escape if the water was heated slowly enough, which was corroborated in 1875 by Fratscher. In 1888, Sedgwick said the apparent contradiction between the results of these experiments was a consequence of different heating rates used in the experiments: "The truth appears to be that if the heating be sufficiently gradual, no reflex movements will be produced even in the normal frog; if it be more rapid, yet take place at such a rate as to be fairly called 'gradual', it will not secure the response of the normal frog under any circumstances". 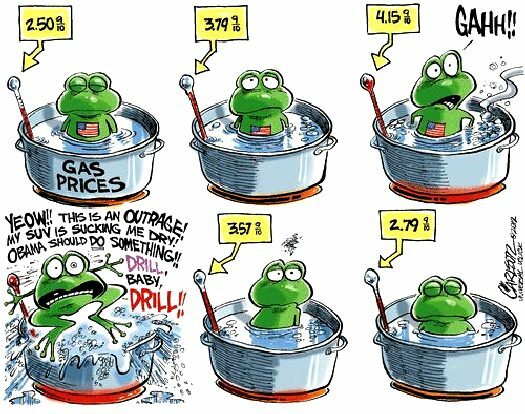 Goltz had raised the temperature of the water from 17.5 °C to 56 °C in about ten minutes, or 3.8 °C per minute, in his experiment, whereas Heinzmann heated the frogs over the course of 90 minutes from about 21 °C to 37.5 °C, a rate of less than 0.2 °C per minute. In "On the Variation of Reflex Excitability in the Frog induced by changes of Temperature" (1882) William Thompson Sedgwick writes: "in one experiment by Scripture the temperature was raised at a rate of 0.002°C per second, and the frog was found dead at the end of 2½ hours without having moved." Modern scientific sources report that the alleged phenomenon is not real. 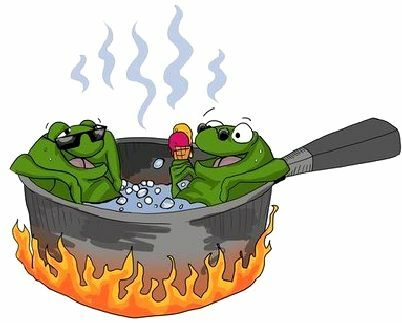 In 1995, Professor Douglas Melton, of the Harvard University Biology department, said, "If you put a frog in boiling water, it won't jump out. It will die. If you put it in cold water, it will jump before it gets hot - they don't sit still for you." Dr. George R. Zug, curator of reptiles and amphibians at the National Museum of Natural History, also rejected the suggestion, saying that "If a frog had a means of getting out, it certainly would get out." 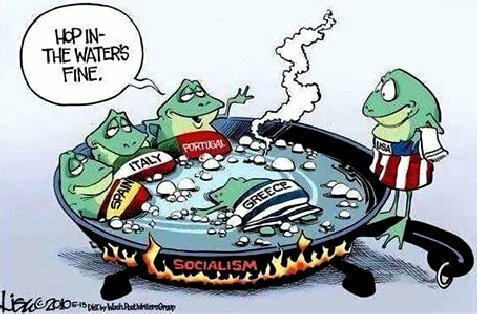 In 2002 Dr. Victor H. Hutchison, Professor Emeritus of Zoology at the University of Oklahoma, with a research interest in thermal relations of amphibians, said that "The legend is entirely incorrect!" 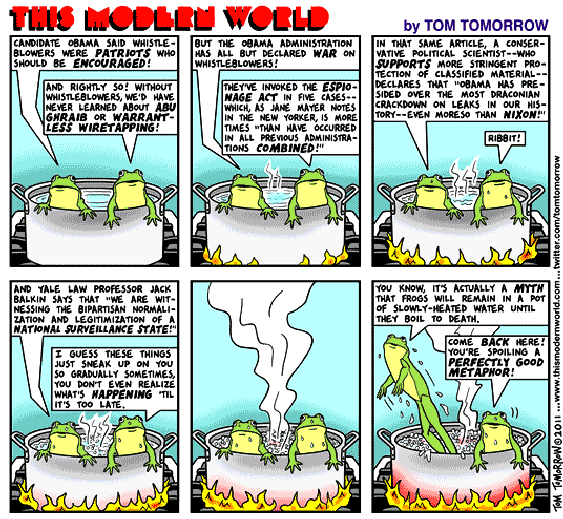 He described how a critical thermal maximum for many frog species has been determined by contemporary research experiments: as the water is heated by about 2 °F, or 1.1 °C, per minute, the frog becomes increasingly active as it tries to escape, and eventually jumps out if the container allows it. Councils are bound by the tenets of the Climate Change Act 2008 to reduce greenhouse gas emissions to 1990 levels. Our Government has given all local authorities until 2050 to achieve that goal. The Climate Change and Sustainable Energy Act 2006 was the earlier legislation that instructed councils to encourage micro-generation. But so far Wealden (our target example) have carried on building more of the same houses that got us into this mess. What we need in an immediate block on the building of houses that do not incorporate energy harvesting features and charging points for electric cars. ALL HANDS TO THE PUMPS - When it comes to climate change we all have to do our bit to halt global warming if we can. If we leave it to our local authorities we'll end up in bigger trouble. Why? Because they did not see it coming and they are still allowing the build of mansions that use heaps of energy that we cannot afford to burn. 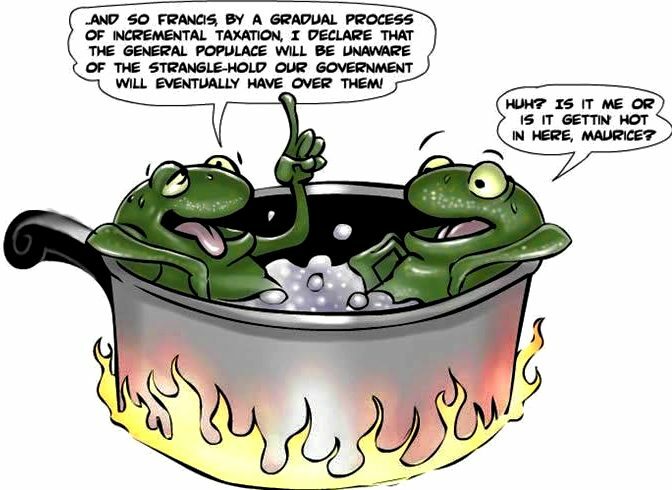 Councils suffer from Frog Syndrome, they will sit in the water that is being boiled until they die, taking down (potentially killing) their children and many other species on earth in the process. Fools yes, but more like homicidal maniacs in climate change terms.